This past week marked the 10th-Anniversary of the collapse of Lehman Brothers. Of course, there were many articles recounting the collapse and laying blame for the “great financial crisis” at their feet. But, as is always the case, an “event” is always the blame for major reversions rather than the actions which created the environment necessary for the crash to occur. 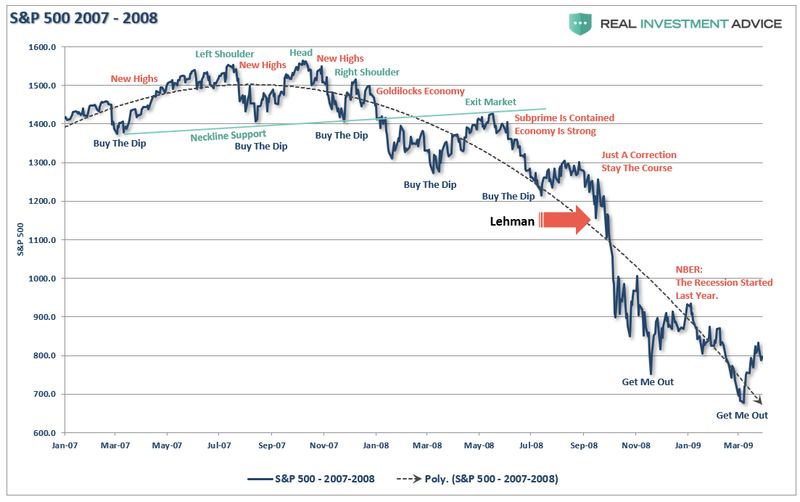 In the case of the “financial crisis,” Lehman was the “event” which accelerated a market correction that was already well underway. I have noted the topping process and the point where we exited the markets. Importantly, while the market was giving ample signals that something was going wrong, the mainstream analysis continued to promote the narrative of a “Goldilocks Economy.” It wasn’t until December of 2008, when the economic data was negatively revised, the recession was revealed. But legislation isn’t the cure for what causes markets to crash. Legislation only addresses the visible byproduct of the underlying ingredients. For example, Sarbanes-Oxley addressed the faulty accounting and reporting by companies like Enron, WorldCom, and Global Crossing. Dodd-Frank legislation primarily addressed the “bad behavior” by banks (which has now been mostly repealed). I think it is actually a little different. In my view, ingredients like nitrogen, glycerol, sand, and shell are mostly innocuous things and pose little real danger by themselves. However, when they are combined together, and a process is applied to bind them, you make dynamite. But even dynamite, while dangerous, does not immediately explode as long as it is handled properly. It is only when dynamite comes into contact with the appropriate catalyst that it becomes a problem. “Mean reverting events,” bear markets, and financial crisis, are all the result of a combined set of ingredients to which a catalyst was applied. Looking back through history we find similar ingredients each and every time. Importantly, debt and leverage, by itself is not a danger. Actually, leverage is supportive of higher asset prices as long as rates remain low and the demand for, rates of return on, other assets remains high. Likewise, high valuations are also “inert” as long as everything asset prices are rising. 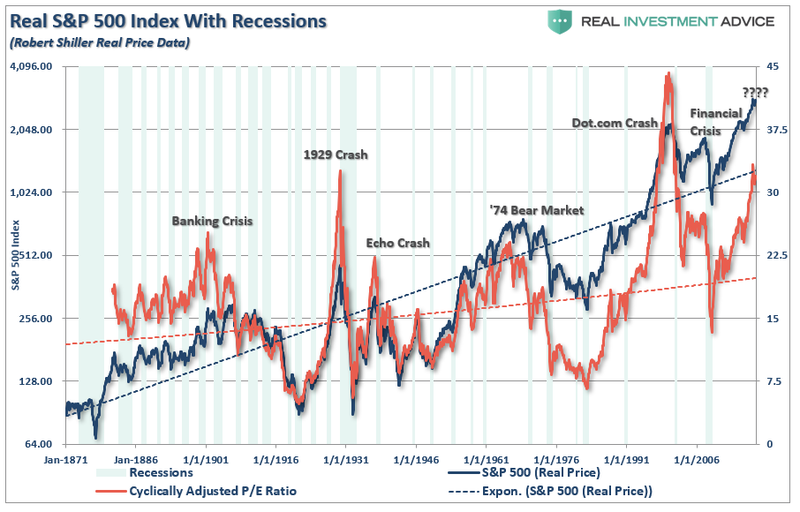 In fact, rising valuations supports the “bullish” thesis as higher valuations represent a rising optimism about future growth. In other words, investors are willing to “pay up” today for expected further growth. While valuations are a horrible “timing indicator” for managing a portfolio in the short-term, valuations are the “great predictor” of future investment returns over the long-term. Of course, one of the critical drivers of the financial markets in the “short-term” is investor psychology. As asset prices rise, investors become increasingly confident and are willing to commit increasing levels of capital to risk assets. The chart below shows the level of assets dedicated to cash, bear market funds, and bull market funds. Currently, the level of “bullish optimism” as represented by investor allocations is at the highest level on record. Again, as long as nothing adversely changes, “bullish sentiment begets bullish sentiment” which is supportive of higher asset prices. Once again, we find rising levels of ownership are a good thing as long as prices are rising. As prices rise, individuals continue to increase ownership in appreciating assets which, in turn, increases the price of the assets being purchased. 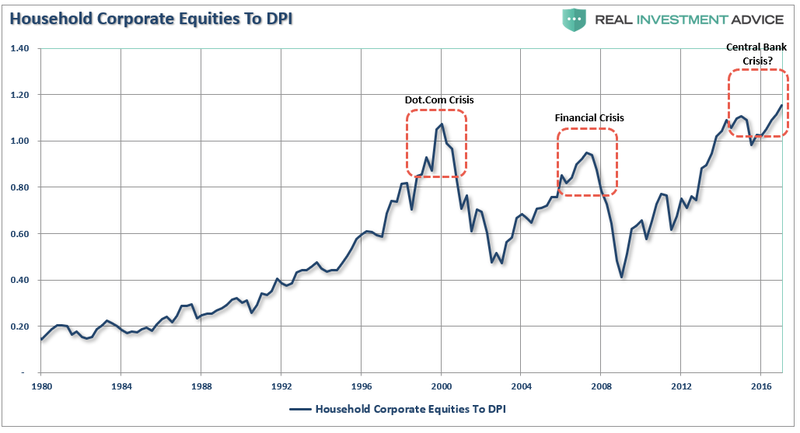 Another key ingredient to rising asset prices is momentum. As prices rice, demand for rising assets also rises which creates a further demand on a limited supply of assets increasing prices of those assets at a faster pace. Rising momentum is supportive of higher asset prices in the short-term. Like dynamite, the individual ingredients are relatively harmless. However, when the ingredients are combined they become potentially dangerous. These same ingredients were present during every crash throughout history. All they needed was the right catalyst. The catalyst, or rather the “match that lit the fuse,” was the same each time. 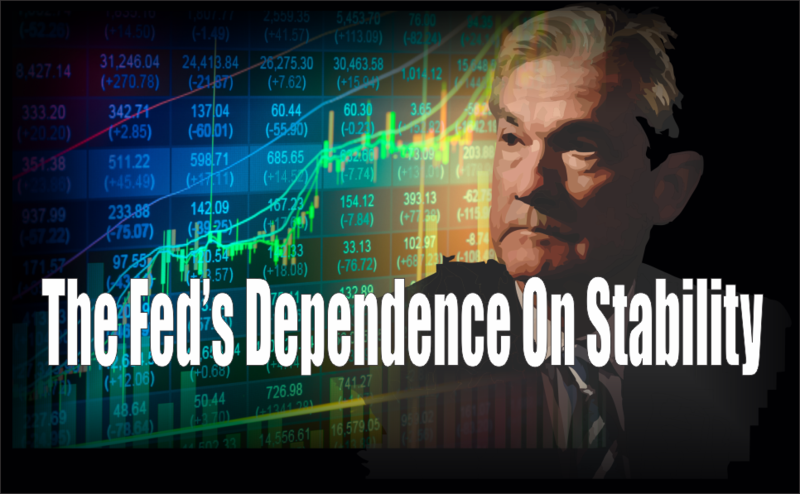 With the Fed expected to hike rates 2-more times in 2018, and even further in 2019, it is likely the Fed has already “lit the fuse” on the next financially-related event. Then suddenly, without reason, the increase in interest rates will trigger a credit-related event. The sell-off will gain traction, sentiment will reverse, and as prices decline the selling will accelerate. Then a secondary explosion occurs as margin-calls are triggered. Once this occurs, a forced liquidation cycle begins. As assets are sold, prices decline as buyers simply disappear. As prices drop further, more margin calls are triggered requiring further liquidation. The liquidation cycle continues until margin is exhausted.